Lendio, the nation’s leading marketplace for small business loans, was certified for the third consecutive year as a great workplace by the independent analysts at Great Place to Work®. Lendio earned this credential based on extensive ratings provided by its employees in anonymous surveys. A summary of these ratings can be found at http://reviews.greatplacetowork.com/lendio. 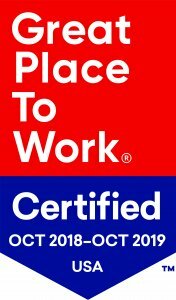 “According to our study, 94 percent of Lendio employees say it is a great workplace,” said Sarah Lewis-Kulin, Vice President of Great Place to Work Certification & List Production. Lendio employees completed 110 surveys, resulting in a 90 percent confidence level and a margin of error of ± 3.91. Lendio employees rated challenges, atmosphere and pride as the most significant factors in their workplace satisfaction. Of those surveyed, 98 percent said they feel a sense of pride in what the company accomplishes, 97 percent said Lendio is a fun place to work and 96 percent said Lendio employees care about each other. Lendio was founded in 2011 to provide a marketplace of financing options for small business owners. To date, Lendio has facilitated over $1 billion in financing through more than 51,000 loans to business owners in all 50 states. Through this access to capital, Lendio’s small business clients have generated an estimated $3.8 billion in economic output and created more than 25,000 jobs in communities nationwide. “Everyone at Lendio is committed to the company’s mission to help small businesses get access to growth capital. Our employees rally around this shared goal and come to work every day excited to make an impact,” said Brock Blake, CEO and founder of Lendio. To learn more about career opportunities at Lendio, visit www.lendio.com/careers. Lendio is a free online service that helps business owners find the right small business loans within minutes. With a network of over 75 lenders offering multiple loan products, Lendio’s marketplace is the center of small business lending. Bringing all options together in one place, from short-term specialty financing to long-term, low-interest traditional loans, our technology makes small business lending simple and decreases the amount of time and effort it takes to secure funding. For every loan facilitated on Lendio’s marketplace platform, Lendio Gives, an employee contribution and employer matching program, donates a percentage of funds to low-income entrepreneurs around the world through Kiva.org. More information about Lendio is available at www.lendio.com. Information about Lendio franchising opportunities can be found at www.lendiofranchise.com.